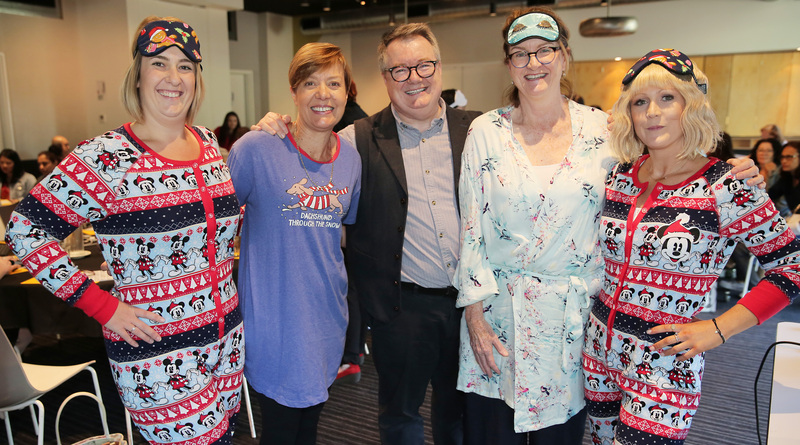 Western Sydney Local Health District learn about PJ paralysis in the comfiest way possible: in their pyjamas. Professor Brian Dolan, Health Service 360 director from the United Kingdom, has encouraged WSLHD staff to end ‘PJ paralysis’ in Western Sydney. As the Founder of the global #endpjparalysis campaign, Professor Dolan is an expert on the mental and physical health benefits of patients wearing day clothes and keeping active during their hospital stay. Professor Dolan shared his insights about valuing patients’ time as the most important currency in healthcare at a health forum held at Atura, Blacktown recently. Many WSLHD delegates donned onesies, dressing gowns, eye masks and slippers, to experience the vulnerability of wearing pyjamas during the day. Registered nurse Jill Waring, executive director operations Robynne Cooke, PJ Paralysis founder Professor Brian Dolan, Blacktown and Mount Druitt hospitals general manager Sue-Anne Redmond and whole of health program lead Leah Dawkins. “Wearing normal day clothes instead of pyjamas helps make patients feel more confident and independent,” said Professor Dolan. This week, WSLHD hospitals started the End PJ Paralysis 100 Day Challenge. Staff in 15 units across a range of specialties are participating in the challenge to get as many patients up, dressed and moving each morning as possible. Patients can support the campaign and improve their health by bringing comfy day clothes to hospital or asking family, friends or carers to bring suitable clothes. Staff communication – we are listening! 17 May, 2018, 12:54 pm Leanne Findlay Comments Off on Staff communication – we are listening!